Over-the-air localization SDK for iOS. Lightweight and easy to integrate. This guide assumes that you have already prepared your iOS app for localization. Need help with this? Read our Getting started with iOS localization tutorial. If you are experienced with iOS localization, give it a quick look as well, just to be on the same page. Lokalise iOS SDK comes as CocoaPod library and can be easily integrated into your Objective-C or Swift project. Once the translations are finalized in Lokalise editor, you generate bundle using Lokalise Download page (or use the API request to generate it). 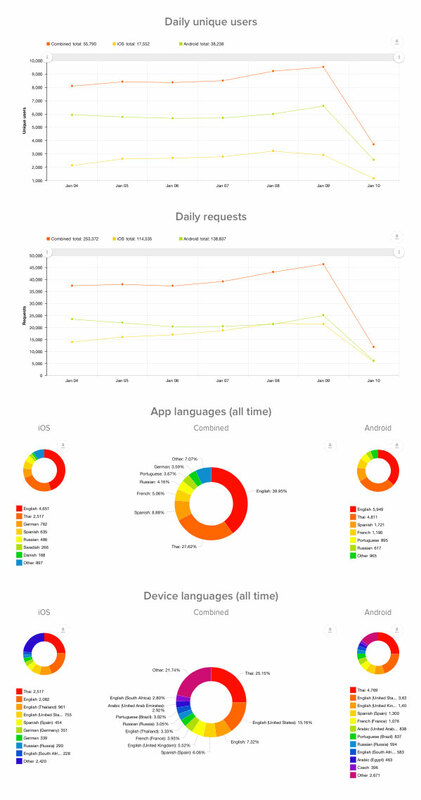 As end user opens your app on his device, the SDK requests latest version of the bundle from our servers and if found downloads and stores it locally. There is additional iOS SDK Live Edit Module, which allows instant preview and updates on the connected device. Some of the system interface objects might not get translated (search bar for example) when changing application language at runtime. In case you choose not to use swizzling, storyboards and nibs will not be localized using our SDK. InfoPlist.string content can't be overridden by our SDK, so don't forget to include the latest translations in your next release. You also need an SDK API token. You can generate it in project settings > General tab. Go to Downloads page in Lokalise, select "Lokalise iOS SDK" as the format and click Build only button to generate the bundle. You will be automatically taken to the bundle versions management page at projects settings. Leave the switches as is for now, see details in Managing bundles section. Make sure to always include fresh Localizable.strings in your project when releasing the app. There are various ways to automate this process, please refer to Part III - Integrating with your project in Getting started with iOS localization tutorial. Dependencies will be installed automatically. Link c++ (libc++.tbd) and z (libz.tbd) libraries to your targets. If you would like to install manually, download Lokalise.framework and add it to your project (embed and link). Link c++ (libc++.tbd) and z (libz.tbd) libraries. Add Run Script to your Builds Phases. We recommend configuring Lokalise iOS SDK within - (BOOL)application:(UIApplication *)application didFinishLaunchingWithOptions:(NSDictionary *)launchOptions app delegate method. To get new translations you need to call checkForUpdateWithCompletion: method. A good place for that is in applicationDidBecomeActive: method of your app delegate. It will be called every time application is launched or restored from background. Lokalise posts LokaliseDidUpdateLocalizationNotification when localization or localizationType is updated. Subscribe to it in any view controller or model to react and update your UI. Lokalise supports production and prerelease versions of the bundle and lets you keep different versions of each bundle. As the bundle is generated, it would take you to project settings / Lokalise iOS SDK section. Flip the according switch in front of the bundle to publish it to production or prerelease (see Testing your localizations section below for description). Hit Save changes to apply. Lokalise offers you to freeze a particular bundle on a particular app version. As you can see on the print-screen below the "Test_01" bundle is assigned to the apps with build from 0 to 6 and the newest bundle is assigned to the apps with build from 7 to 12. This feature is supported with the Lokalise iOS SDK 0.8.0 and up. If you are building for TestFlight or Crashlytics and don't want to mess up production app's strings, want to see local translation or no translation at all, it's handy to use localizationType option. If it's LokaliseLocalizationPrerelease, the SDK would download fresh Prerelease bundle (according to the table on image above). // Loads production localization (Default type). // Uses localization included in local app bundle. // Returns keys instead of localized string. You need to add language in your Xcode project, only then it becomes available in the app. Lokalise SDK does not dynamically add language to the app if you add it in Lokalise. Lokalise iOS SDK is compliant with Software Requirements defined in App Store Review Guidelines. Lokalise doesn't load executable code prohibited by rule 2.5.2. Ensure that your Localizable.strings and other .strings files are localized as default language of your project and not Base language. If this doesn't help or you are experiencing other issues contacts us in live support chat that you can find in bottom right corner of this page.